No Balcony? Create A Mini Indoor Garden With These Cute Succulents & Cacti! Thorny Affair (+5 for a punny name) is a company that does planters, dish gardens and terrariums specifically for our cramped city spaces. All their planters are the hard-to-kill, pretty-looking kind that are perfect for those who love greens, but don't have the time (or are too lazy) to maintain them. Shweta, the founder of Thorny Affair, felt that not enough brands offer stunning, easy-to-maintain greens and planters. Hence, she quit her job and nurtured her love for plants by starting her own green business. This Bangalore-based company is addressing the needs of every 20-something urban dweller who thinks that gardening is tough and we can barely drink water ourselves, how are we going to water our plants?! Thorny Affair mostly does succulents and a variety of exotic cacti that require minimum water, sunlight and even space. No balcony? No problem. Their planters can fit in a ledge, a shelf and they even do a bunch of hanging pots in stunning gold and black colour. 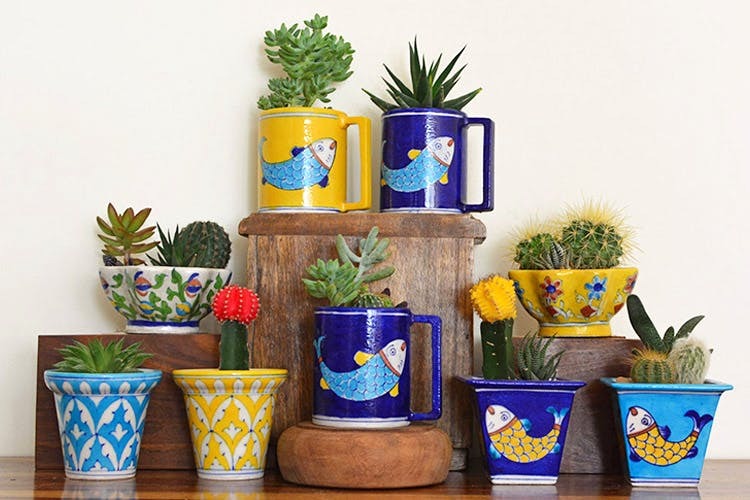 We're also fans of their plants in a mug that come in bright colours and will be such a cute addition to your bedside table. Also, how cute is this baby cacti?! If you have a friend who loves plants, be a darling and gift them one, maybe? Since Thorny Affair is based in Bangalore, shipping massive dish gardens and terrariums might be difficult. However, they can easily ship the smaller pieces and the hanging planters safe and sound (yay). Just ping them, and they'll happily share more options as per your requirement. Check out their Facebook page here (they're quite prompt) and follow them on Instagram too. Price: Starting at INR 490.